This poem tells the tale of an old man alone in his home who is visited by a raven, proclaiming that his beloved will return to him nevermore. 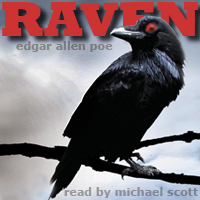 I will have to start by saying that the narrator of this EPICALLY MORBIDLY BRILLIANT piece of literature was IMPECCABLE to say the least, and The Raven is a complex and intricate PEEK into the Oh so clever and ABSOLUTELY PERPLEXED, by the onset of insanity, of the WARPED MIND of the GREAT poet Edgar Allen Poe! The EXTREMELY descriptive and grammatically erratic writing style of this poem will have you caught in your own mind and dissecting word by word for an "ABSOLUTE" Conclusion that NEVER existed!! You just CANNOT NOT TIRED OF THIS CAPTIVATING STORY!! There are several varieties of narratives of The Raven, but this has the best by far NARRATIVE of the Race that it's as if Poe himself were telling you himself!!! BRAVO!!! HIGHLY RECOMMENDED to any SERIOUS Poe lover!! I love the book and the reader was great. Narrator did a wonderful job! Great tempo. Love Poe. This poem has been lost with my ageing and well-defined cynicism. My fault. Good narration, great tempo. I will not go into the poem because I assume that most people have at least an idea of what to expect from Poe. I was not expecting much, being that this is a free book but I have to say that I was surprised by the quality of the narration.